COME, O CHRIST, THE LORD! Along with so many others, I looked in amazement at the horrific and tragic happenings in Newtown, Conn. Such sadness seems quite beyond our capacity to handle. Mercifully we can take comfort in the fact that this is the season of HOPE and we are sorely in need of such a virtue. Advent helps us to focus on the presence of our Savior among us and inspires us to know that the sadness of evil that still runs rampant among us will ultimately be undone when He comes again. Even this past Gaudete Sunday weekend, as I celebrated Masses at the prison in Oxford and the joy-filled Eucharist with the people at Resurrection Parish – they were celebrating the hundredth anniversary of Saint James Parish – my heart was filled with sadness over the loss and the fear that pervades the lives of so many people with such a tragedy. Our society pays heavily in times like this for the tireless efforts to remove God from our lives. To whom shall we go, if not our loving Father? Who understands better the loss of children than God, who saw the loss of the innocents shortly after His Son entered this world? Who better than our Mother, Mary, to weep with us over the tragic death of her child? God is with us. It is times like this that make it so important to keep Christ visible in our lives. It is truly the point of the Incarnation – God is with us. As we earnestly start to prepare for the full scale launch of the Cause for the Beatification and Canonization of Father Joe Walijewski, might this not be a good time to seek comfort from God through his intercession? Father Joe sure understood the need to care for children and really worked hard to make at least some part of the world safe for them. This might be a great time to ask the Lord to help us and to send some peace to those who mourn through Father Joe’s intercession. Of course, I hope to see you at Sunday Mass! This entry was posted in Uncategorized on December 17, 2012 by dioceseoflacrosse. As you know, we are preparing to officially open the Cause for the Beatification and Canonization of Fr. Joe Walijewski, a priest of our Diocese who founded Santa Cruz Parish in Bolivia and Casa Hogar Juan Pablo II in Peru. Many people of our diocese have been to visit both places. Unfortunately, I never had the opportunity to meet “Padre Jose” as so many of you have. Happily I am able to present another priest whose Cause is also being introduced at this time. Fr. Casimir Cypher, a native of Medford, Wisconsin, was a Conventual Franciscan Friar, like me. I had the privilege of knowing “Fr. Cas” from my early days in high school, college, and theology. He was brutally and sadistically murdered in Honduras in June of 1975. He was the first of the martyred missionaries of Central America in those sad days of murdered Jesuit priests and Maryknoll and Ursurline Sisters, Lay volunteers, and even Archbishop Oscar Romeo. This week, several friars from my Franciscan Province of Saint Bonaventure (Chicago Province), pictured above (L to R: Dcn. Paul Schneider, Fr. Luke Poczworowski, Fr. Al Lopez, and Very Rev. 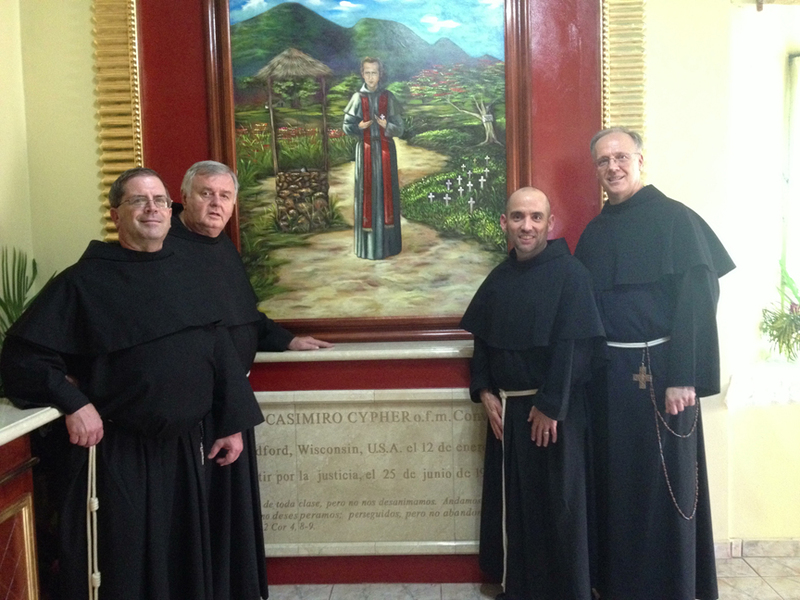 Patrick Greenough, Minister Provincial) went to visit Fr. Casimir’s tomb in Honduras. Fr. Casimir’s Cause is finally going to be opened—an event I have worked for and prayed for since his death was announced in 1975. Saints are among us! Perhaps no one ever thought, while they talked with him or listened to his stories about South American children and their wretched poverty, that one day, Fr. Joe Walijewski would be considered a saint. Likewise, none of us who knew Fr. Casimir would think of such a thing. But they were different, weren’t they? Wasn’t it always fun to be around them—didn’t they bring a unique quality to our sense of being human? They seemed to be such fine people—not overly holy or pious—but just really good people. In this Advent season, and in preparation for Christmas—the coming of God in the flesh—wouldn’t it be nice if things like that could be said about us? The Incarnation in action—Jesus, alive, active and recognizable in us? What a thought! Something like this might start at Sunday Mass. May I see you there? This entry was posted in Uncategorized on December 11, 2012 by dioceseoflacrosse. For those of you who are kind enough to listen to our radio program “Connecting the Diocese” on Relevant Radio, you have probably heard me spend some time chatting with Jack Socha of our Communications Department concerning the season of Advent and its many facets, but most especially, its chief component, the Blessed Virgin Mary. Two major celebrations of Our Blessed Lady occur during the Advent season and both are relevant to our consideration of her as a centerpiece of our Advent joy and reality. Saturday is the Solemnity of the Immaculate Conception. This feast is all about Mary’s immaculate conception in the womb of her mother, Saint Ann. It’s about how Mary was chosen by God, before all ages, to be His Mother. Mary, of course, like all of us, had to listen to Sacred Scripture, learn to have a relationship with God in prayer, and learn to understand that God is faithful to His promises. In short, Mary had to become a faithful believer in God. This she did. Saint Augustine reminds us that Mary was God’s faithful daughter before she became His mother. Her faith empowered her to say “Yes” to the announcement of the Archangel Gabriel, in spite of its astonishing sound and equally amazing consequences. This, of course, all took place in time. Time exists for us. God is eternal. So God allowed Mary, through a unique and divine prerogative, to share in the joy and the rewards of the salvation that would come from Jesus. From the very moment of her existence in the womb of her mother Saint Ann, God allowed Mary to experience the joy of the freedom and the liberation from sin that comes from the Savior Himself – she was immaculately conceived. Thus, she is and remains the Immaculate Virgin Mother of God. Under the title of Immaculate Conception, the Blessed Mother is revered as the Patroness of the United States. The other great feast marks Mary’s own maternity of Jesus: The Feast of Our Lady of Guadalupe. Mary herself appeared to Saint Juan Diego in Mexico in 1531 as a pregnant woman. Of all of her apparitions on earth, this is the only time Our Lady appeared this way. The beautiful and mysterious, highly venerated, and intensely studied, image of her countenance was miraculously imprinted on the tilma, or cloak, of Saint Juan Diego. In this title, Our Lady is revered as the Patroness of America (both North and South). I’m hoping that you are taking some Advent time to wait with Our Lady and prepare for Christmas with her. With her, I’ll see you at Advent Mass! This entry was posted in Uncategorized on December 5, 2012 by dioceseoflacrosse.